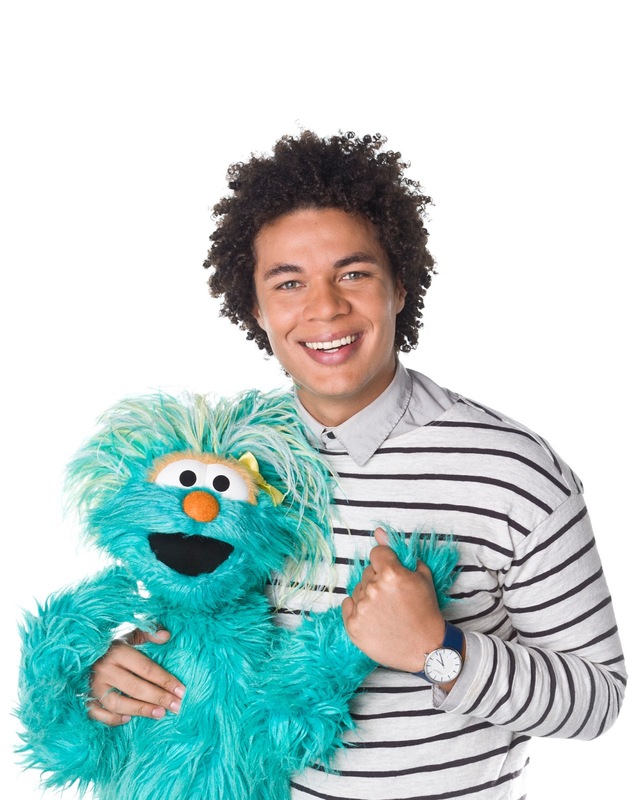 Yes, I had the chance to meet Ismael Cruz Cordova -- aka, new Latino character Armando on Sesame Street -- while I was in Miami at the PBS Annual Meeting. He's originally from Puerto Rico and is quite charming -- he even writes poetry. That's something he said helped him feel as if he had a voice. I met up with him and Rosita and asked them what it was like on Sesame Street and what their favorite word was in Spanish -- a language I wish I could speak! 'Peg + Cat' will debut on PBS Kids on Oct. 7. As if I needed another reason to love PBS Kids! 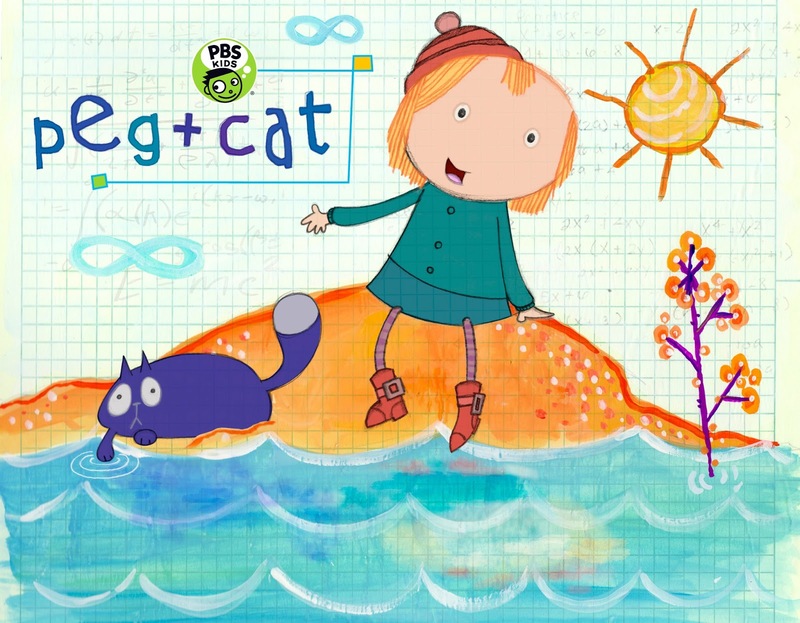 The kid-friendly arm of PBS will be launching a new girl-friendly, math-friendly animated show in the fall, Peg + Cat (that's Peg plus Cat), and I caught a sneak peek of the adorable newbie at the network's annual meeting a couple of weeks ago in Miami. Actually, I had the chance to check out lots of upcoming highlights from both PBS and PBS Kids -- including meeting Sesame Street's new character, Armando (Ismael Cruz Cordova) -- but more on that later. Peg + Cat is a new show from creators Jennifer Oxley and Billy Aronson that really aims to make math fun -- and succeeds from what I can see. Peg is an adorable and clever girl who likes to solves problems with her pet Cat (named Cat, of course). A girl after my own heart, she also likes pie. Cat is her deadpan yet calming sidekick, who calms her down when she starts to freak out. Of course, you know what I'm going to say. CC loves girl heroes, particularly ones that look an awful lot like her, like Peg. In fact, she's been happy to read the accompanying Peg + Cat book I got at the meeting. The story, which also happens to be based on the show's first episode, has Peg planning a picnic with a pig. A Cat. And a chicken. She's given everyone a slice of pie based on their size (hers is the biggest because she is the biggest, and the little chick gets the smallest, natch). Yay math! Not only that, but 100 chickens get loose, and she has to count and put them all back. The book is silly fun -- not dry at all. In fact, as chickens are going crazy on the loose, CC kept laughing and pointing to the one that was shaking its bottom in the air. Of course she was. I also love the clever design touches like the infinity clouds and the graph paper background. And while it's geared toward preschoolers, even kindergartners will enjoy the laughs. It's rare that I talk to two celebrities in one week, but I caught up with Julie Delpy at the Four Seasons to talk about her new movie, Before Midnight. We talked about everything from long-term relationships to growing older to her Paris-born son's American accent. It's all here at mom.me. Modern Family actress Julie Bowen discovered her 6-year-old son had life-threatening allergies when he experienced anaphylaxis as a toddler. Check out my interview with the super-funny and two-time Emmy-winning actress over on mom.me. While she's serious about educating parents about anaphylaxis, she's also really funny when it comes to talking about her 3 boys -- 6-year-old son Oliver and 4-year-old twins John and Gustav. When comparing her experience with young boys to her character Claire's older children, she says, "I’m at the very caveman period. It’s very male and grunty and filled with laughing and crying." L.A. Story Is a SoCal Journalism Award Finalist! All I can say is "wow" right now. I was reading FishbowlLA and discovered that L.A. Story is a finalist in the Blog, Individual category for LA Press Club's 55th annual SoCal Journalism Awards. So excited! And completely stunned. 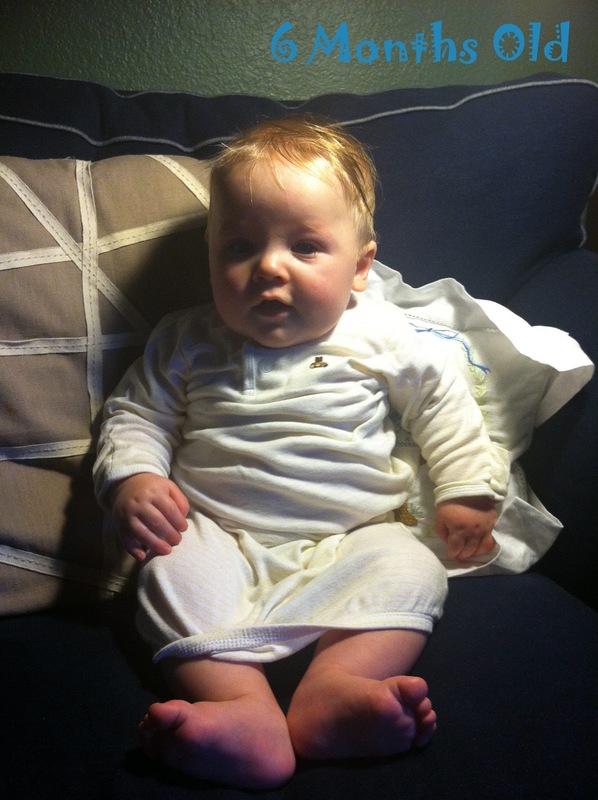 The two posts I submitted -- Last Days as an Only Child and Waiting for My Baby -- were (are!) so meaningful to me, and it's amazing that they're getting recognized. Thank you, LA Press Club! And congrats to all the other finalists! 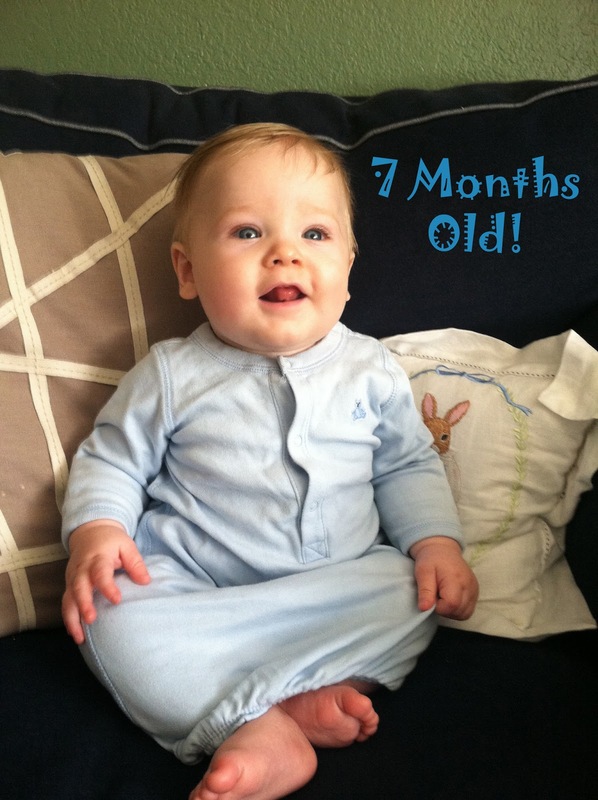 Baby Will is 7 months old! I know this monthly update comes closely on the heels of last month's 6 month post, but this picture is lighter, brighter and makes me really smile. Plus, we have another update! While picking Will up from daycare last week, I found out that he can sit up by himself. I figured he was on his way -- he is a super-fast crawler, after all -- but I hadn't seen his newest feat for myself. ... Until Saturday. He sits up in the cutest way. Here's how he does it. While lying on his tummy, he pushes his chest and bottom up with his arms (like a little mini push-up). Then he gets his bottom higher and higher into the air, walks his little legs closer to his tummy, as if he's going to stand up, and then, PLOP! He plunks his bottom onto the floor, and voila! Sitting baby! It's so funny and sweet to watch. Even more funny and sweet? Watching CC and Will interact. They really make each other laugh. In fact, that's why I chose this photo. CC was behind me while I was taking it, and Will got a kick out of watching her put on a show. CC got a dose of Disney magic, as her formerly white-on-white bedroom transformed into a glittery, periwinkle playroom. Thanks to a festive shade of Disney Paint and a subtle-yet-charming top coat, CC's once-monochrome walls now have a splash of glittery fun. I found out that as long as you organize everything beforehand—the brushes and rollers; placing the tape on the wall's edges; setting the drop cloth; and basically just having a strategy—painting can actually be fun. Who knew?! The topcoat was even easier, as I just used the roller to spread the glittery white liquid over the already-painted walls. (The white eventually disappeared, by the way.) In fact, I decided to glitter up CC's pink bathroom walls while I was at it. You can see the glitter here (left), which really looks great when the light hits it just right. So to celebrate CC's "new" room, I invited over some CC's friends from school and the neighborhood. It was really fun, asking all of the girls to don their favorite princess attire. We had princess goodies on hand, including tiaras and wands, as well as treats for the kiddos and grown-ups alike. So, would I dive headlong into a painting project again? I would. Everything was much easier than I'd thought. And would I choose Disney Paint? Definitely. In fact, next time, I might even go for the chalkboard paint, aka Great Slate! UPDATE: Congrats to Jennifermiya, noreen and Anita Althans, who won the What Maisie Knew prize pack! Please email me at losangelesstory@gmail.com with your addresses so I can have them sent to you. Thanks to everyone who participated! Divorce is obviously hard -- doubly hard when you have parents who are intensely self-involved. That's what happens in new movie What Maisie Knew, starring one of my favorite actresses Julianne Moore and opening in Los Angeles May 17. Based on the novel of the same name by Henry James, the film tells the story of 6-year-old Maisie as she's navigating life with parents who are way less than ideal. Julianne Moore stars as an aging rock star to Steve Coogan's contemporary art dealer, and their bitter custody battle is less about providing a stable home for their child (Onata Aprile) than making the other one suffer a more damaging blow. When the two parents then take on (again, less-than-ideal) new partners -- Maisie's former nanny, Margo (Joanna Vanderham) and the much younger bartender, Lincoln (Skarsgard) -- things go from bad to worse. As Maisie gets older -- and is shuffled from house to house -- she realizes that she must rely on herself instead of her selfish parents. To spotlight What Maisie Knew, I'm giving away 3 sets of goodies from the film and from Julianne Moore. To enter, leave a comment below telling me your favorite Julianne Moore movie. Good luck, and I will announce the 3 winners on Friday, May 24! I spent Mother's Day weekend with my kiddos taking in the gorgeous view from the 12th floor of the Hilton Anaheim. Talk about the power of a semi-staycation. While Ian had to work (boo), CC, Will and I made the hour-and-change drive down to Orange County and enjoyed an overnight break from the normal L.A. routine. We also watched a kid-friendly movie from the comfort of our cozy hotel beds, slept in until -- wait for it! -- 7:30 a.m., and had an amazing Mother's Day brunch, complete with a chocolate fountain, pastries and Will's first restaurant high chair. And don't forget the special game of hide-and-seek, which is doubly fun when you're in a lovely hotel room. Yes, this Mother's Day was incredibly special. Thank you to the Hilton Anaheim -- and, of course, my family. CC and Will giving me the fish eye at the Hilton Anaheim Mother's Day brunch. Let's talk feelings for a moment. You know, those big swells of emotion that sometimes inspire your little one to stomp, shout or *eek* hit? What I loved about CC's preschool was its major focus on the kids using their words instead of doing things like hitting, kicking or biting when they got upset. 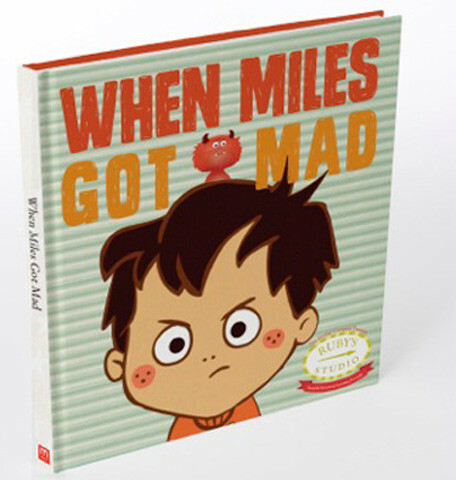 And that's exactly what the book When Miles Got Mad ($12.95) spotlights. In the book, from The Mother Company, Miles is playing with his little brother Max, when Max breaks his toy airplane. This, of course, makes Miles very angry, and he yells at little Max. 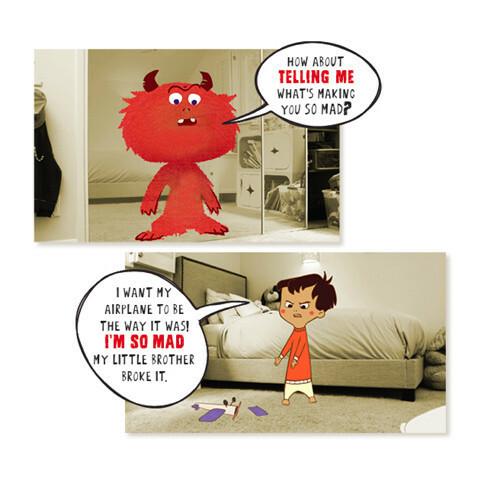 In fact, he gets so mad that instead of his regular reflection in the mirror, he sees a red monster with horns instead. The red monster tells Miles to try hitting a pillow. No dice. But when Miles starts talking to the monster about why he's mad, slowly but surely his anger gets less and less intense. A great lesson for little kids, who sometimes don't know what to do with all of that emotion. Not to mention a great vocabulary-builder to boot! I received a review copy of the book and have been reading it to CC every day since. And she's the one who's been asking to read it over and over again. I think she likes that the book is honest about kids and their emotions. Yes, kids have them! The feelings are validated, but it's the actions that need to be considered. And CC gets that. There's a problem, but there's also a solution. I've been so proud of CC for using her words when she gets upset. She's not afraid to say what she's feeling. And while she doesn't hit, she has turned her back on me, crossed her arms and frowned. But it's books like this one that lets kids know -- through words and adorable illustrations -- that it's OK to get mad, but talking it over will make you feel better in the end. And isn't that what they really want anyway? That precocious, vocab-loving superhero WordGirl will be saving the day once again in a new DVD, WordGirl vs. The Energy Monster, hitting store shelves on May 14. 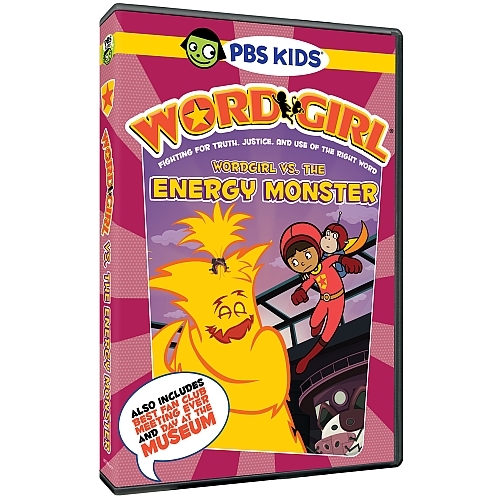 CC and I got an advance screener from PBS Kids, and we had a lot of fun watching as young Becky Botsford (*cough* WordGirl *cough*) donned her superhero disguise, alongside her sidekick Captain Huggy Face, to take on a few bad guys -- and one talkative girl, aka The Energy Monster. There are three adventures (the first of which is broken into two parts) on the DVD (SRP: $9.99) that showcase WordGirl's love of, well, words, as well as her ability to crush her cartoonish enemies who are usually up to no good. As usual, CC loves when a girl character is the one taking center stage, especially a smart and spunky one like WordGirl. The comic-book cartoonishness of the series is a fun throwback to shows like Batman or Spider-Man. The villains are unforgettable, too. CC kept pointing out Chuck the Evil Sandwich-Making Guy, and calling him Mr. Sandwich Head. ...Awesome. There's also Dr. Two Brains, who in Dinner or Consequences, Parts 1 and 2, is stealing the city's milk to turn the city into lots of cheese. He gets some help from the super-chatty Energy Monster to fulfill his dastardly deed. Of course, Becky, aka WordGirl, has to take out the villain without revealing herself to her unsuspecting family, who's upset that she keeps leaving and missing Dad's special dinner. In Best Fan Club Meeting Ever, Becky's brother TJ holds a special meeting only for International WordGirl fan members. When a frenemy crashes the party, it looks as if WordGirl will need to save the day. There is one more episode and plus bonus features, including video games, shorts and coloring pages. It's a cute DVD that celebrates words and girl power -- a big plus when you have a daughter who gets tired of all those boy heroes. Saturday kicked off the first day of the 8th annual REDCAT International Children's Film Festival, and CC, Baby Will (yes, he came too!) and I took in a fun assortment of short films from all over the world. CC's favorite? A Taiwanese film called The Knitting Girl, about a little girl with seriously cool hair who can create anything by simply knitting. Anything. The other films in the Short and Sweet lineup were exactly that -- cute little shorts that appealed to the smallest of filmgoers, Will included. I couldn't get Stompy the Bear (Charlotte Blacker, U.K.) out of my head for hours. The catchy tune in that short film accompanied a group of different colored bears. What stuck with me the most, though, was a film called Chinti (Natalia Mirzoyan, Russia), about an ant that finds a stamp with the picture of the Taj Mahal on it. He loves it so much, he decides to build his own (which keeps getting knocked down by various elements) -- dedicating his whole life to the task. I won't tell you what happens in the end, but it's so charming, heartwarming and unexpectedly lovely. REDCAT, you've done it again. Check out my previous post to find out about other upcoming sections. While I was a little overwhelmed with the whole motherhood thing when I had CC, this time around, I think I'm ready to try a Baby + Me Yoga class. After all, Baby Will loves it when we play the "up and down" game -- he's even started trying to pull himself up on his own. Exhale Santa Monica is offering exactly that class for new parents of babies ages 8 weeks to 2 years. The next one will be Sunday, May 5, at 2 p.m., and I wanted to pass along the info to you. 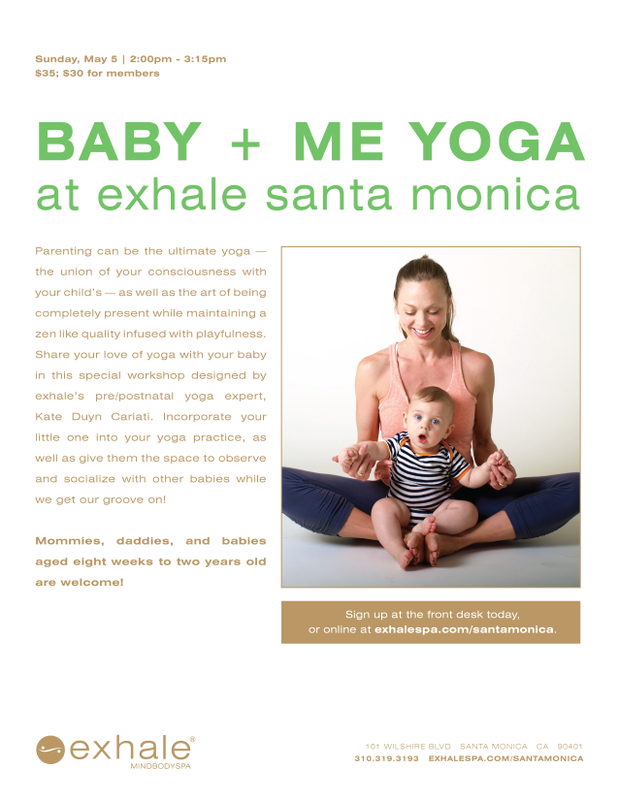 The 1 1/4-hour class will mix yoga with a little infant socialization. How cute does that sound? I would love to see Will stretching his legs with other little munchkins. OK, so I'm a little bit late posting this month's update on how Baby Will is growing -- and growing he is! It's funny to look back at what he looked like at 1 month old and see the difference. I mean, he's almost completely covering the bunny pillow in this (admittedly shadowy) pic. Crazy! Will started crawling today! He's been pivoting around a lot on the bed and on the floor, but today he was like a little inchworm and scooted his way over to a bag half-way across the living room. Lucky for us, we got it on video! Everything is going by so quickly, and Ian and I are already getting a little nostalgic. Our baby is already on the move. And it's only just starting! REDCAT for kids is back! This weekend kicks off the 8th annual REDCAT International Children's Film Festival, and CC and I are looking forward to yet another few weekends of funny, endearing and clever short kids' films from all over the world. More than 30 countries to be exact. CC loves heading downtown every year to catch the films, and I enjoy seeing the international audience that is Los Angeles. It's fun to hear all of the different languages -- and there are many -- that parents are speaking to their film-loving kiddos. * "Short and Sweet" (Sat., May 4; Sat., May 11; Sun., May 19; ages 2-6) -- This gentle line-up of animated films is a perfect introduction to big-screen wonders for your little one. Meet a dancing bear, play with a mischievous hen, get to know pixies and encounter other lovely, lovable creatures. * "China Fantasia" (Sat., May 4; Sun., May 19; all ages) -- Thrill to the artistry, imagination and deep love of Chinese culture on display in animator Joe Chang’s China Fantasia. This sumptuously told tale blends popular Chinese folk music with Chang’s masterful use of traditional Chinese painting techniques, cut-paper and glorious swirling color. 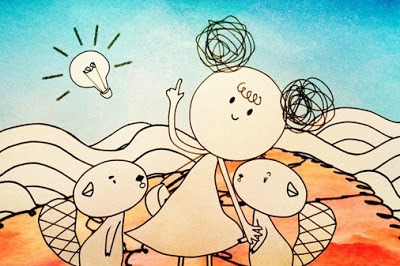 * "Small is Powerful" (Sat., May 4; ages 7+) -- A not-so-silly goose saves the day, a brave girl gets ready to jump into the unknown, and one little red brick makes a big difference in this inspiring series of animated shorts. * "Animal Kingdom" (Sun., May 5; Sat., May 18; ages 4+) -- This program of beautiful animation is designed to delight kids who love critters both large and small. Enjoy the antics of elephants, birds, foxes, mice, pigs, hedgehogs, dogs and cats, and meet a seriously hardworking ant! 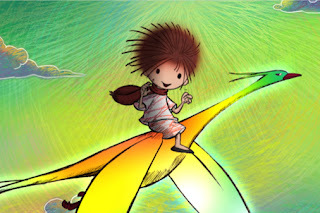 * "Caleidoscopio" (Sun., May 5; Sun., May 19; ages 8+) -- Co-presented by the Caleidoscopio de Sueños Festival, Bogotá, Colombia. Take a live-action and animated journey to beaches, back roads, jungles and bustling cities throughout Latin America. Get ready to encounter exuberant kids, luminous magic, lively music and surprise endings. * "Continental Hop" (Sun., May 5; ages 7+) -- Grab your passport for a trip around the world through imaginative animation, captivating documentary and children’s drawings brought to life. Ready, set, go! From the US to Turkey, from Bangladesh to Belize—then soar above Europe atop a magic piano! * "Path Waves" (Sat., May 11; ages 8+) -- Co-presented by the Smithsonian National Museum of the American Indian and Longhouse Media View the lives of indigenous people in the US, Canada and Australia through the lenses of exuberant young filmmakers and polished professionals. Eleven short films offer Native perspectives through traditional tales, video poems, and stories of family and friendship. * "Nickelodeon Family Fun Day, featuring Nick Jr. and Nickelodeon" (Sun., May 12; ages 2-6; ages 7+, respectively) -- Nickelodeon showcases the most watched and loved of children’s programming, and at Nick Family Fun Day attendees have the opportunity to meet the costumed characters of Nickelodeon and Nick Jr. favorites—SpongeBob, Patrick, Dora and Diego—and receive giveaways. * "For the Beauty of the Earth" (Sat., May 18; ages 8+) -- The silver screen goes green for this collection of live-action and animated shorts about our ever-changing planet. These humorous and thought-provoking films are designed to make kids think, ask questions and come up with new ways to honor Mother Earth. * "Shiver and Shake" (Sat., May 18; ages 9+) -- Spend an hour on the edge of your seat with these international shorts—films to make you crack a smile and raise a goose bump or two. If you’re ready to face down floating heads, space aliens, spooky dolls, creepy birds, dark shadows and skeletons, then this program is for you!